Cosmopoint KK Sabah is now open for new student registration for Mac –June 2017 Intake. 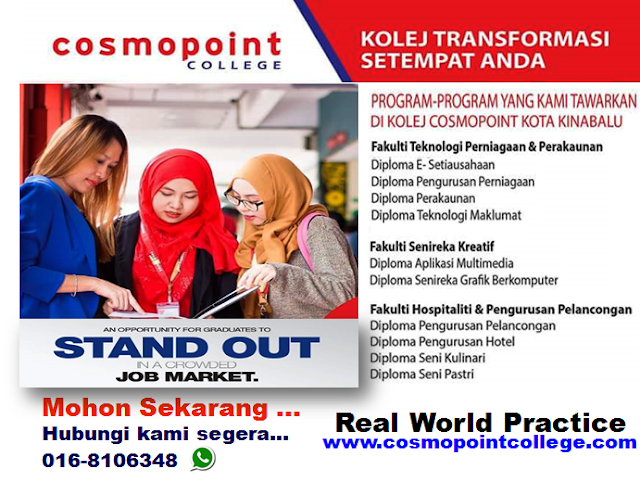 community, you may contact Sir Amir- registration staff from Cosmopoint KK Sabah at 0168106348 for course consultation and also further info about financial support available. Facilities : Hostel (free) + Transportation (provided). If you are interested, please feel free to call Sir Amir for more information and stop by to Cosmopoint KK Sabah (Wisma Times Building) to meet his for consultation. You may also SMS <NAME> <IC NO> to 0168106348 for quick response. You are most welcome to be part of Cosmopoint KK Sabah.